Dusty the dog was described as a matted mess when he was rescued from the Orange County Animal Care Center. Now well-groomed and taken care of, Dusty uses his paws and nose to do the simple tasks his owner, Janet Quintanilla, cannot do from her wheelchair. However, Dusty didn't have the usual story of getting trained by his owner. Inmates serving time for crimes like driving under the influence, drugs and burglaries at the James A. Musick County Jail did. After the dogs are rescued by volunteers from animal shelters, the nonprofit Cell Dogs program connects the dogs with qualified inmates who train and discipline their four-legged companions. Quintanilla said when she and Dusty met there was an instant connection. "He's got great eye contact and I think that's what endeared us to each other, when we looked at each other we knew we were for each other," Quintanilla said. Jail officials say the dogs create an even deeper connection among the other inmates. "They all come together. Less arguments, less fighting," said Deputy Kelly Bryant, the director of inmate programs. "They become the center of attention and it's like they're all taking care of them. It makes a calming of the dorms." After eight to 12 weeks of training, the dogs are released to a new home. This labor of puppy love now counts more than 40 dogs among its graduates. 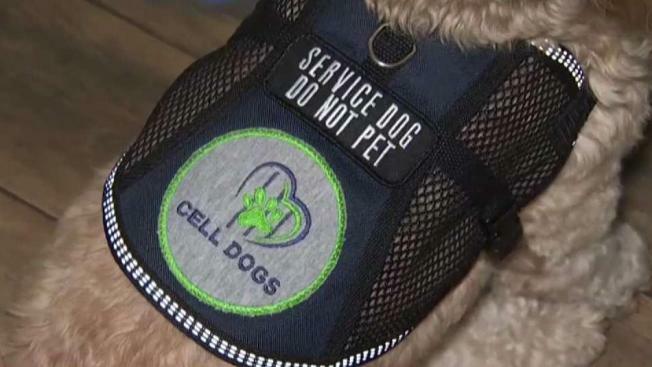 "This is probably the first time in their lives a lot of them really felt a need to give back and also the pain of doing that and help somebody else," Cell Dogs Program Director Janette Thomas said. Like most people, the inmates develop a connection with the dogs they train. The dogs are even allowed to live with the inmates in their barracks. "It’s bittersweet, you know? The dogs will be useful for other people and beneficial, but I miss them a lot," inmate Kimberly Harris said. After pairing trained dogs to needed homes and creating a positive space for inmates, organizers see the Cell Dogs program as making a difference on both sides of the leash. Remember Dusty, the wide-eyed cockapoo? His owner says were it not for a broken person, this formerly broken dog wouldn't be here.